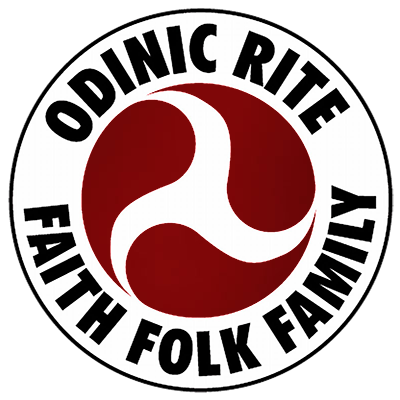 Fundamental to Odinism is Natural Law, which works consistently to support positive evolution within a balanced context at all levels. One of the expressions of Natural Law is seen in the fact that there are males and females of many species, including in human beings. At the most obvious level, the interaction of men and women is crucial for the creation of children and hence, the survival of a family and the community. However, in order for this to happen successfully, the underlying male and female energies need to be balanced and to complement one another, otherwise there will be a dominance of one energy over another- an imbalance which will ultimately weaken both polarities and hence, the ability of a group to survive. We witness this crisis in wider society today where the insidious poison of monotheistic mindsets that denigrate the female energies has led to a materialistic society whose very fabric flouts natural law, creating pollution, apathy, lack of principle, family and community breakdown in it s wake. Thus, all life is weakened.One of the main contributory factors to this situation is the dogmatic assignment of ‘value’ to the terms ‘masculine’ and ‘feminine.’ Hence, the so-called ‘masculine’ values of dynamism, strength, rationality etc have been seen as of a more ‘positive’ value than the so-called ‘feminine’ values of receptivity, passivity, intuition etc. This is reflected by the importance wider society places on ‘successful careers’ and ‘roles’. Usually, those activities regarded as ‘successful’ call for the exhibition of the so-called ‘masculine’ qualities, whilst the crucial ‘feminine’ roles of housewife and mother are riddled with low expectation. Equally, many people unconsciously equate ‘role,’ ‘value’ and ‘gender’ with one another and hence, their sense of self-esteem and level of personal development may well be undermined by the limits of these ‘labels.’ This placing of comparative ‘value assignments’ on the two genders seriously threatens the integrity of the family and community and- as we see today- leads to divisiveness, chaos, weakening and the denigration of all. In Odinism, we see that both the Gods and Goddesses have crucial roles relative to life’s picture, and each God has a complementary Goddess. And whilst all roles are vital to the bigger picture, no single one is considered more important than another: all are required for the sustenance and evolution of society and tapestry of life. But neither are the Gods and Goddesses limited to their personal roles: they are inherently a God or Goddess because they are an expression of the lifeforce. Thus, their role is an aspect of them, but not their total being. Similarly, humans- male or female- can have a variety of roles in life; but as a unique expression of the lifeforce, they should work to transcend these limitations. But crucially, this should be in balanced cooperation with each other. For whilst men and women are each powerful in their own right, balanced cooperation will actually enhance and deepen those inherent forces which create, sustain and evolve life.Thus, by proudly working to restore the true and ho ly nature of the male/female polarities in proper relationship to each other, so our folk will be restored to their rightful strength.